The Planning Commission has approved a hike of Rs 21.04 crore for development works in Chandigarh during the ongoing financial year. With this, the budget for development in Chandigarh has risen to Rs 187 crore. Originally, it had been pegged at Rs 165.96 crore. The top brass of the police might have convinced the inquiry commission about the sensational jailbreak conspiracy but they seem to have left the “little ones” unimpressed with the investigation. Two brothers, aged seven and eight, of Bapu Dham Colony were allegedly detained and beaten up by their tutor, a Sector 18 resident, yesterday to recover Rs 60,000 “stolen” from her cupboard by the two. A 45-year-old man, father of four daughters and a son, allegedly jumped to death from the fourth floor of his office in Sector 9, here this evening. Ashok Kumar, a clerk, was declared brought dead in the General Hospital. 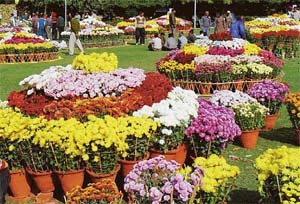 The three-day annual chrysanthemum show at the Terraced-Garden, Sector 33, organised by the horticulture wing of the Municipal Corporation, gets underway tomorrow. On the eve of the show the flowers on display were judged in three categories of individual amateurs, private and government agencies. The acting Director of Punjab Engineering College (PEC) , Dr Baljeet Kapoor, has been asked by the Chandigarh Administration to reply on the tapes in which he has purportedly instigated one of the employees to protest against the notification making PEC a deemed university. In a major shift from its earlier policy, the Chandigarh Administration has discontinued the practice to interview IAS officials of Punjab and Haryana before taking them on deputation for senior posts in the Chandigarh Administration. Nancy, who called off her marriage after an alleged demand for dowry by the family of the bridegroom, was not stable in relationships, alleges the family of the boy. 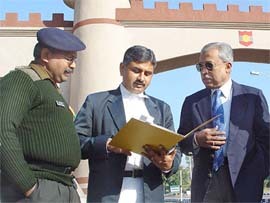 Secretary of the erstwhile Phukan Commission of Inquiry, Mr S K Dasgupta today produced several original video tapes shot by operatives of a news portal, tehelka.com as evidence in a general court martial trying Col Anil Sahgal at Chandimandir for professional impropriety. Thickset glasses show the misery in Bishan Kaur’s weary eyes as she scrambles out of a car at the Chandigarh Press Club for addressing a gathering. Exhaustion gives way to determination as she grabs a microphone to talk about a rath yatra being organised for getting her son — BSP supremo Kanshi Ram — “released from illegal custody”. The local Municipal Council has earned over Rs 14 crore in the past nine months from the collection of octroi in the township. This amount has been collected by the council employees and, according to sources, is at least Rs 2 crore more than what the contractor could have collected. The race for the post of Managing Director, Chandigarh Industrial Tourism Corporation is hotting up. The key post is meant for an IAS official and is considered to be high profile since CITCO owns some of the leading hotels in Chandigarh. President of India's Census medals and certificates of honour will be presented during a function to be held tomorrow at Shivalik Public School in Sector 41. 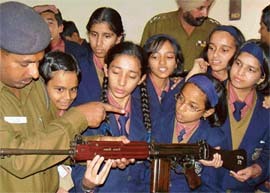 The Punjab Governor, Gen S.F. 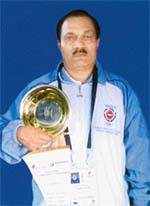 Rodrigues, will be the chief guest. The Chandigarh Territorial Congress Committee celebrated the birthday of Congress President and UPA Chairperson, Ms Sonia Gandhi, at Rajiv Gandhi Bhavan, Sector 35, here today. The police has registered a case against a suspended school teacher on charges of cheating, criminal conspiracy and forgery on the recommendation of the local SP, Mr Rakesh Agrawal. An Assistant Manager of the Reserve Bank of India allegedly transferred Rs 4,74,900 fraudulently to the Union Bank of India and got the money transferred in his own account. Rakesh Kumar Gupta reportedly wrote a letter to the Union Bank of India informing them about transfer of Rs 4,76,900. In a daylight burglary, thieves reportedly decamp-ed with cash and valuables worth Rs 15,000 from a Phase II residence of an industrialist here. The house owners had gone to Patiala during the day, taking advantage of which thieves gained entry into the house and ransacked it. Mr T.J. Bata, owner of Multi national company Bata, a brand in footwear, along with his wife, Ms Sonia Bata, visited his flagship store at Sector 17 today. 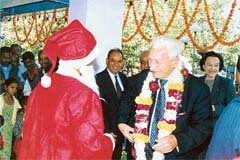 It was his second visit to the Chandigarh after 19 years. Mr T.J. Bata, owner of multi-national company Bata, and his wife at the company’s Sector 17 store in Chandigarh on Thursday. Ganeev, a leading Delhi- based export house manufacturing for international brands like Zara, HNM, Gap and domestic brands like Benetton and Unistyle, sees enormous potential in the booming Indian market. Mr Mohan Singh, Director-General, Centre for International Trade and Industry (CITI), here today urged the Government of India to encourage establishment of bio-tech industry in the state. The American Corner — first stop for accurate and up-to-date information about political, economic, cultural, educational and social trends in the USA — will open on December 14 at T.R. Central State Library in Sector 17, Chandigarh. The members of the Board of Governors of PEC Deemed University today unanimously decided to seek approval of the Central Government before making any amendments in the memorandum of association in future. The indefinite fast by three students of the Department of Laws, Panjab University, in front of the office of the Vice-Chancellor, here today, to press for the condonation of lectures entered the second day, here today. Dr Pushpa Chaudhary, former Professor, Panjab University, has instituted an award, named as “Late Professor Iqbal Nath Chaudhary Memorial Gold Medal”, to be presented annually at the university convocation to a student standing first in MA (political science) annual examination. Students of Shemrock Senior Secondary School here celebrated their annual day today. 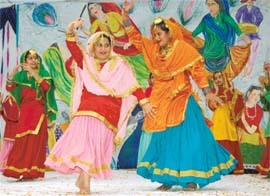 Almost every student of junior classes of the school performed on the stage and got an opportunity to exhibit his talent and discover confidence. Even as a tug-of-war between Mr Anil Ambani and Mr Mukesh Ambani for the control of the Rs 90,000-crore Reliance empire continues, there is a trouble for the group on the Chandigarh front. Mr Justice Mehtab Singh Gill of the Punjab and Haryana High Court has issued notice on a petition filed by the Punjab Government, seeking cancellation of bail granted to the accused involved in murderous attack on Mr B.C. Sharma, General Secretary, Uttariya Railway Majdoor Union. The eight women, arrested in four separate flesh trade rackets busted by the Panchkula police, were remanded in the judicial custody till December 23 after they were produced in the district court, here today. Despite the lukewarm response accorded to Sanjay Gupta’s “Plan”, trade pundits have pinned their hopes on his forthcoming murder mystery “Musafir”. White Feather Films, “Musafir” is presented by Sanjay Dutt. This is the first time in Hindi cinema that an actor has presented a film. Dutt is the founder of White Feather Films Pvt Ltd.
“Veer-Zaara” left many misty eyed at a local cinema last evening. Many also wept silently. There were, however, moments of cheer also with sportspersons and delegates from Pakistan Punjab, who are here to participate in the Indo-Pak Punjab Games, whistling gustily as only Punjabis can when Amitabh Bachchan and Hema Malini made their screen appearance. “Apna sangeet vaje apna sangeet” and “nachangi sari raat”, were the war cry of Stereo Nation at the pop concert organised at the Yadwindra Public School here last night. And the nearly 10,000-strong crowd danced on their feet to the thumping music. The concert saw the likes of Junoon, Apache Indian, Sayyad, Sukhwinder and Harbhajan Mann, who dished out hit after hit. Harbhajan Mann performs at a pop concert at YPS ground on Thursday in Patiala. Anupam Kher will be in the city to stage his autobiographical play “Kuchh Bhi Ho Sakta Hai” at Bhargava Auditorium tomorrow. Directed by Firoze Khan and written by Ashok Patole, the play is a solo act, an autobiographical soliloquy on the actor’s life. When 14 students from Panjab University and its affiliated colleges joined hands to indulge in poetry this afternoon, one wondered if this “first-of-its-kind experiment” in PU’s history would succeed at all. Here were youthful members of Davitya, the recently formed organisation of 250 students from PU, talking big - of national stakes, of social maladies and of pure verse. WINNERS are not different from the rest but do things differently”, believes a city-based music band, The Innovatives”. The band comprises six college students. City-based Amritpal Singh is just 4 feet and 4 inches tall, but his height has proved lucky for him. Because of his height only he could enter the acting world. The convocation ceremony of the Shri Dhanwantry Ayurvedic College and Hospital, Sector 46, was held here today. The Panjab University Vice-Chancellor, Prof K. N. Pathak, was the chief guest and he awarded degrees to the students. Ayurvedic students are all smiles after they receive their degrees in a convocation held at Shri Dhanwantry College and Hospital in Sector 46, Chandigarh, on Thursday. Dysfunctional relationship with parents and the inability of the older generation to address the need of teenagers is the leading cause of stress among schoolchildren in the city, next only to their need to excel in academics. Importance is accorded to kabaddi, wrestling and hockey in Pakistan Punjab, said Mr Naeemullah Khan Shahani, Sports Minister of Punjab (Pakistan), while talking to this correspondent. Mr Shahani said it was his first visit to India. He said the team had attended camps before coming to Patiala and wanted to put up a good show with sportsman spirit. The Indian youth badminton team is back from Bendigo, Australia, with a silver medal won in the Second Commonwealth Youth Games that concluded on December 4. Hosts SGGS College, Sector 26, bagged the title in the second Chandigarh State Korfball Championship that concluded today. In the final, SGGS outplayed PU Campus, 12-07. The Inspector-General of Police, Chandigarh, Mr Rajesh Kumar held a meeting with officials of the Police Control Room in the Traffic Police Auditorium, Sector 29, this evening. The Punjab Urban Planning and Development Authority has put into motion the process of acquiring land for the development of new Sectors 90 and 91. After dilly dallying over the mode of collecting auction money, the Chandigarh Administration today finally issued a notification saying the bidders will have to pay the entire sum within 90 days of the auction. The Registering and Licensing Authority, Chandigarh, will shortly start a new series CH-03-R. Motor vehicle owners, who are desirous of obtaining a particular registration number, can submit their applications with the prescribed fee to the office of the RLA by December 10.